August Greene Blasts Through High-Speed Jazz Rap Single, 'No Apologies,' on 'Tonight Show': Watch - Pop It Records - NEW MUSIC EVERYDAY! 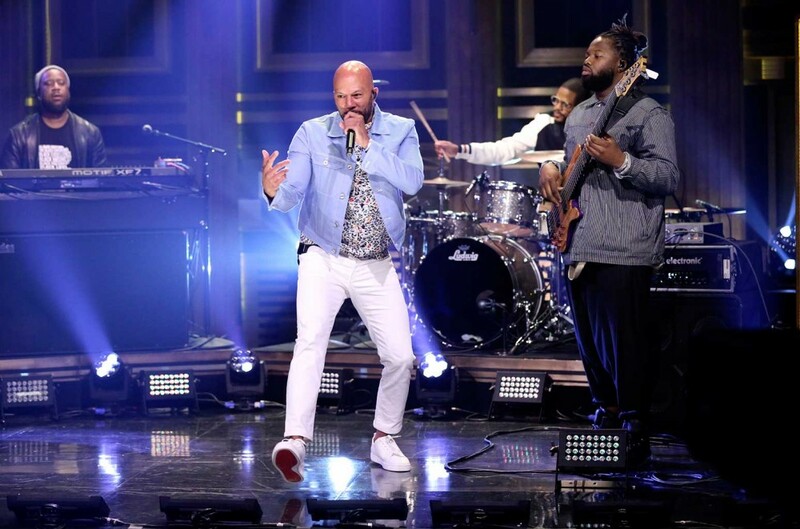 Hip-hop supergroup August Greene shocked the Tonight Show crowd with an electrifying performance of their frenetic single, "No Apologies," on Monday night (Aug. 13). The group, which consists of Common, Robert Glasper, and Karriem Riggins, blasted through the track with their dizzying fusion of hip-hop, R&B and jazz. Riggins jump-started the performance with a Dilla-style drumbeat while Glasper unleashed a hypnotizing trill pattern on the keys as a sampled clock ticked in the background. After a quick tempo change, Common jumped into action, speed rapping, "The government tried to swallow me, wish we had our own colony/ Black space odyssey, we land on property/ I'm an anomaly to the economy, get dollars, we chase policy/ Eat God degree, watch Amélie, unapologetic, no stopping me philosophy." Common held the crowd's attention with more than just his rhymes, though. The seasoned rapper, dressed in white jeans and a light denim jacket that helped him stand out from the rest of the group, bounced around the stage to Riggins' frenzied beat while waving his right arm around at a dizzying speed. As the song drew to as a close, the stage lights turned a deep red and Glasper took off on a spacey keyboard solo. August Greene formed after the three members were nominated for an Emmy for their song "Letter to the Free," which was a part of the soundtrack for Ava DuVernay's Netflix documentary 13th. The group's self-titled debut album came out in May and features the singles "Optimistic" and "Black Kennedy."